Dr Who fans, here is something you might want to get your for kids – especially if they have yet to find the same love as you for the TV series. Supposing you fork out £199.99 for this Dr Who Ride On Dalek, which hopefully, will make them see what a cool parent you are, and turning their allegiance from Glee to a much more serious TV series. This Dalek body is composed from a mixture of ballistic nylon/laminated rubberised polyvinyl which is soft and tactile to the touch. 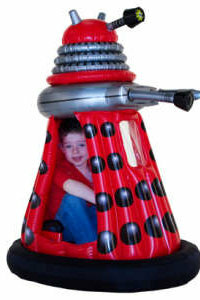 Basically, getting around in this Ride On Dalek shouldn’t leave any doubts in your mind – it is very durable, structurally safe, tear resistant and easy to inflate and assemble. Standing tall at 128cm with 360 degree movement, the Dr Who Ride On Dalek boasts of 10 sounds and phrases, lights within so that you need not ride in the dark, a 6v rechargeable battery, and a maximum speed of 3km per hour – this makes sure wayward kids who are thinking of using this as an escape ride won’t go very far.